“April cold and wet, fills the barns best yet.” Indeed I find there are a number of weather sayings supporting the idea of a cold April being the forerunner of a good summer. “East wind in Spring a brilliant summer will bring” is another. As I write this, after the balmy weather of the past couple of weeks, we are promised a big change for the coming weekend. In a recent edition, I mentioned Buchan’s warm spells but there were cold predictions as well. Blackthorn winter is a Buchan’s cold period from 11th to 14th April, “just as blackthorn is coming into blossom, expect a cold snap” Though in recent years, some plants seem to have been a bit confused about their intended flowering times. I expect as per usual, April will be changeable. Rainfall for February 214.5 mms – 8.58 inches compared to February 2013, 99.5 mms – 3.98 inches. Thank you Linda. Have you seen on television, the edition of James May’s Toy Stories where he constructs the model railway track from Barnstaple to Bideford along the Tarka Trail? Perhaps not as adventurous but Christ Church will certainly be full of model railways in October. This year the theme of the Flower Festival will be railways and model railways and after last year’s success with agricultural equipment, must make a big effort. Now, have you got an old train set or any railway models gathering dust in the attic? The team need to know how much stuff they can count on for the display, so if you can contribute anything, please let Sue Rawle know. 01598 763202. My Hornby 00 Inter City 125 will be there! And in the near future, make a note in your diary, Saturday, April 5, sausage and mash and skittles evening in the village hall, starting at 7pm. All proceeds to Christ Church funds. he Craft Afternoon set themselves a challenge last month for the annual North Devon Hospice knit in. They elected to “knit-a-chick” During the session they indulged themselves in a vast array of cakes and umpteen cups of tea and produced 13 small chicks designed to hold a small cream egg. With the continuing support from our local Parracombe Stores, they were able to display their basket of chicks, each including a Cadburys cream egg, for sale at a cost of £2 each. All proceeds will be for the North Devon Hospice. 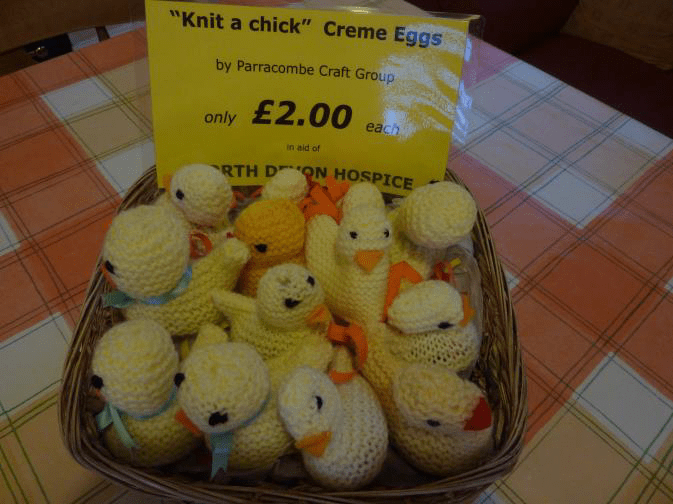 At present they have a total of over £100 and, as the demand still continues for these popular little Easter gifts, they will carry on knitting. So hurry to Parracombe Stores to choose your special chick. They are available in a variety of bright colours!! If you have walked that way recently you will have seen that the rebuilding of Parracombe is progressing exceptionally well and moving towards the final stages of completion. Key Stage 2 children from Parracombe and Kentisbury recently visited the workshop of Robert Paterson, who is producing the stained glass window that the children designed last year. The window will be a focal point of the new reception area and will be an ever-lasting reminder of how Parracombe School rose from the ashes. Key Stage 1 children Young Berries are working at Kentisbury and have been finding out about dinosaurs and making their own information books and writing their own stories based on the book ‘Dinosaurs and all that Rubbish’ by Michael Foreman. In maths, pupils have been practising their number bonds and using them in everyday contexts, such as shopping as well as learning about 2d and 3d shapes and their properties. The project theme this half term has been ‘The African Savannah’. In support of this, a zoo trip is planned for the end of this term so that the pupils can get ‘up close and personal’ with some of the animals that they have encountered on the page. Key Stage 2 Elderforests have been learning how to write instructions and very much enjoyed making pancakes on Shrove Tuesday to aid their understanding. In maths they have been focusing upon multiplication, division and time, using both analogue and digital formats and using their understanding of time to solve real-life problems. In their theme learning, they have been conducting research into the 1969 moon landing and thinking about how these incredible space pioneers may have felt when they first stepped onto the moon. The recent National Science & Engineering Week was a huge success across the federation. The theme this year was ‘Exploring the Future’ and pupils enjoyed a wide range of activities including designing and making wind powered cars, investigating how to survive on a desert island and designing, making and testing balloon rockets. The highlight of the week was when the federation was joined by Frances Harrision, a local artist and dark sky enthusiast. Pupils spent the day working in groups exploring how artists and storytellers have been inspired by the night sky, finally producing their own art work and taking home a stargazing diary that they will complete before it eventually forms part of an exhibition to be housed in Lynmouth later this year. And that’s it for another month. See you all here at the beginning of May.